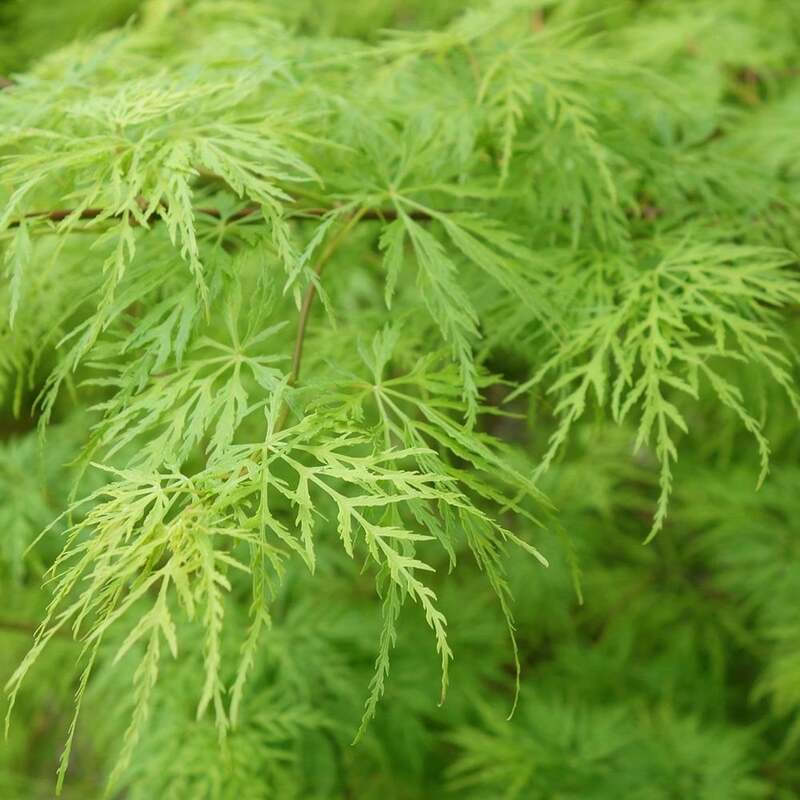 Acer palmatum dissectum Viridis is a lovely little mound forming Japanese Maple, offering deeply dissected, lace-like foliage that displays a bright, lime green colour throughout spring and summer. The colour is even brighter than Acer palmatum Dissectum and turns intense shades of orange and gold in the autumn. Growing to an estimated height and spread of 2 x 3 metre in 20 years, Acer palmatum Viridis is ideal for any sized garden, whether you want to create a stunning focal point or use it as an attractive back drop to other plants. This threadleaf Japanese Maple prefers a moist, well-drained soil in a sheltered position, ideally in dappled shade. In addition to our range of younger sizes, we offer Viridis as a mature specimen that makes a fantastic feature in borders, set into lawns or in a large container. Pot grown Dissectum Viridis Japanese Maples can be planted at any time of the year. Firstly, remove all weeds and grass within a metre of your desired planting hole then dig a square hole as deep as your root mass and approximately 2x as wide. To help your tree establish more effectively, we advise sprinkling root grow in the hole, especially if you have poor soil. Pruning should be carried out in the dormant season (November to March) as Japanese Maples bleed during other times of the year, which can weaken the branches. Dissectum Viridis rarely need pruning as their natural shape is normally the most attractive. Any pruning should be carried out with a less is more approach, only removing crossing, damaged or diseased branches.